Seeking shelter from rocket attacks is nothing new to the children of Sderot, which has been a major target of Hamas since 2000. We've been following the news these past few weeks, especially since sirens have been sounding their 15 second warnings beyond Sderot to Ashkelon, Ashdod, and even as far north as Tel Aviv and Herzliya. How are kindergarten children supposed to behave in such a situation? In previous attacks, studies have shown that 90% of children between the ages of 4-18 show signs of post-traumatic stress syndrome. Because the missiles fall daily, the Israeli government developed a warning system called ‘Code Red’ or Tzeva Adom. When a rocket is launched, a voice comes over the loudspeakers throughout the region saying “Tzeva Adom, Tzeva Adom”, “Code Red, Code Red”. At this point people know they have fifteen seconds to seek shelter. Fifteen seconds to stop whatever they are doing and find a place to protect themselves. 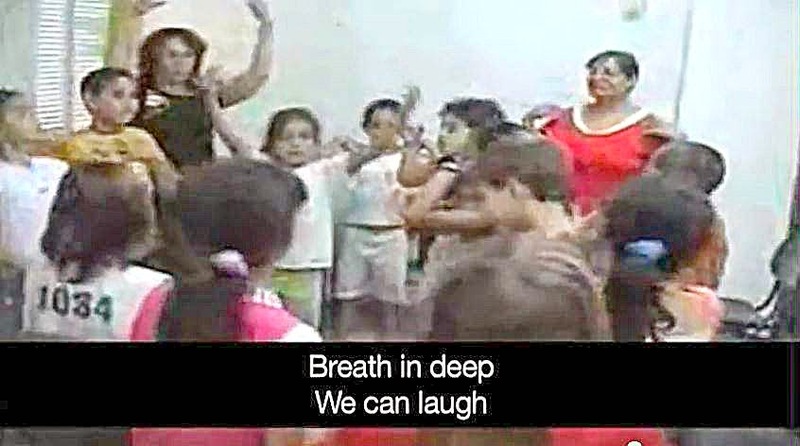 In order to help children cope with this constant tension, the Joint Distribution Committee’s Ashalim division, a partnership between JDC, the Israeli Government and the UJA Federation of New York working on behalf of children in Israel, developed a series of therapies, including the Code Red Song. This song, first written in 2010 and posted on YouTube in 2012, teaches the children what to do when the alarm goes off, but also helps them deal with their emotional reactions to the sound and the situation. Sderot teacher and art therapist Shachar Bar is credited for composing the song, which has become very popular on YouTube this week. The song combines lyrics that allow the children to express their anxiety and fear with hand and body movements that help distract their minds to something more positive. JDC distributed CDs of this uplifting children’s song to parents and teachers. The song is taught and used in the schools and has quickly become a source of comfort for the children living in the Southern confrontation zone. The children have learned that song, dance, and laughter can be helpful in coping with a dangerous situation. We hope that they will very soon be able to resume their normal singing, dancing, and laughing to their favorite songs without the warning sirens warbling in the background. Kol hakavod to Shachar Bar and all the brave children singing her song during this traumatic time. A Joke to Start the Week - "Dating Advice"